“All the world’s a stage, and all the men and women merely players; they have their exits and their entrances” – As You Like it – William Shakespeare. While good old Will was not referring to traders he honed in on a key aspect of the human condition: Predictability of behavior and development. Surely enough for days I seemed like a lone wolf on twitter pointing out the world is flat theme it was only after yesterday’s $ES shelling that articles were popping up left and right how the US is disconnected. Too late guys. These articles would have been helpful when you were all pushing the bullish narrative. Yesterday’s relentless selling caught many off guard and stops were mercilessly hunted and it seemed finally US markets caught on to the world’s woes. Yet as I told you 1845 $ES was a key level to ponder this week. We did indeed get the bounce off of that level and I traded according to plan: Took profits on shorts, scaled out of puts and started scaling into longs. Why long now when we finally get a solid day of selling? Simple: Poetry. The market is still following a script it seems. While US markets chose to ignore global selling for days they drop on the Thursday before March OPEX? The day that is typically associated with a low? Markets move to oversold just prior to Yellen & FOMC next week? Markets sell just before positive March seasonality next week? Add to this the 2000 market analog, the only other time when markets went into overdrive excess on tech valuations which saw its high emerge during the week of March OPEX and you have a solid set of arguments why we would see yet another surge higher into next week. Remember all the short positions I pointed out the other day. They are still there. It was pointed out yesterday that markets are not even that oversold. That is correct. US markets are not. But overseas markets are big time. Just look at Germany, they just got hammered over the past few weeks, especially this past week. Yesterday was just brutal. 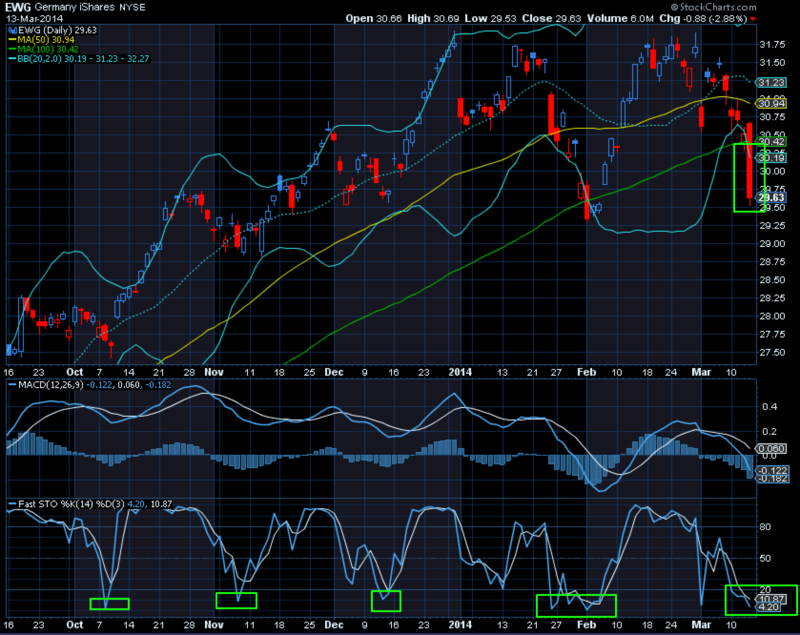 These markets are vastly oversold which creates an imminent bounce risk. So know if you are short you are facing a major gap up risk every day now into next week’s OPEX. Russia/Ukraine? Israel? Missing plane? Economic data? We already know these things do not really matter. Some eventually will, but not quite yet. On the Russia front what is really supposed to happen here? Nothing. NATO, US, Germany will all talk tough and scream sanctions but they will not get involved militarily. Putin knows this. The world is economically too interconnected, plus a war with Russia is simply a military non starter. So he will saber rattle, they will shout, but in the end Crimea is gone. Nobody is going to risk war. Same strategy as when Hitler marched into the Sudetenland and eventually annexed Austria. Putin has no global war ambitions, but he is strategic and the world is different now. 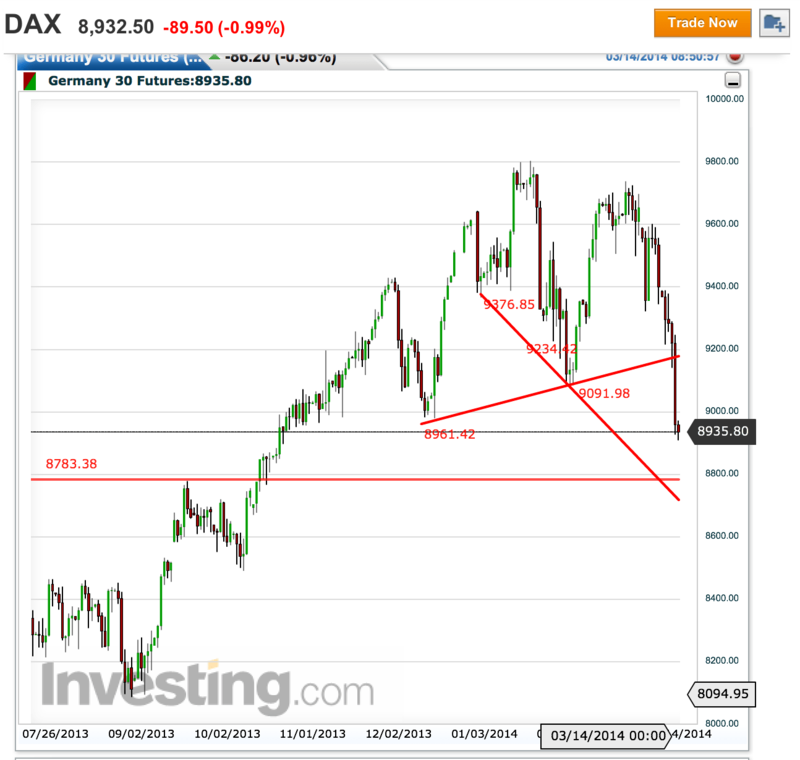 Nevertheless European markets have reacted and the #DAX has gotten hammered with a neckline penetrated. My view is given the extreme disconnect from key MAs and the deep penetration below the lower Bollinger band #DAX will rebound in the next few days into testing the broken neckline which fits nicely with the positive factors I described above. If next week plays out according to the scenario I outlined, it is then later March into April/May which will likely see the long awaited fireworks of a solid correction. Frankly I remain in the 2000 analog camp: Significant volatility all year long, with ripping rallies and fast corrections with an ultimate trend lower to possibly closing the January 2013 January gap that remains open to this day. And this scenario would be a trader’s dream, one that I intend to take full advantage of and I hope you can as well. Trade plan today: Any weakness I will aim to expand into long book. I will shy away from opening any 3/14 options positions with the exception of another go at $VXX puts if markets scare participants some more. In regards to my remaining March 22 put positions: The one’s I have remaining I now treat as a hedge in case markets drop further than I anticipated. Any further weakness today and I am likely to keep scaling out of these. While I am playing long for next week I’ll keep exposure limited as I am more interested in selling another spike next week. CPC ratio: Complacent just a few days ago (as pointed out here), it quickly spiked into previous top areas. $AAPL compression getting to point of resolution. The next move will be big I suspect. I may play long here with some March OPEX calls. $VIX. The intervals seem rather predictable. Looking at the large spikes we see mini spiked in between. Timewise we are in a mini spike with a big spike likely in April/May according to this framework. This would fit with my thesis. 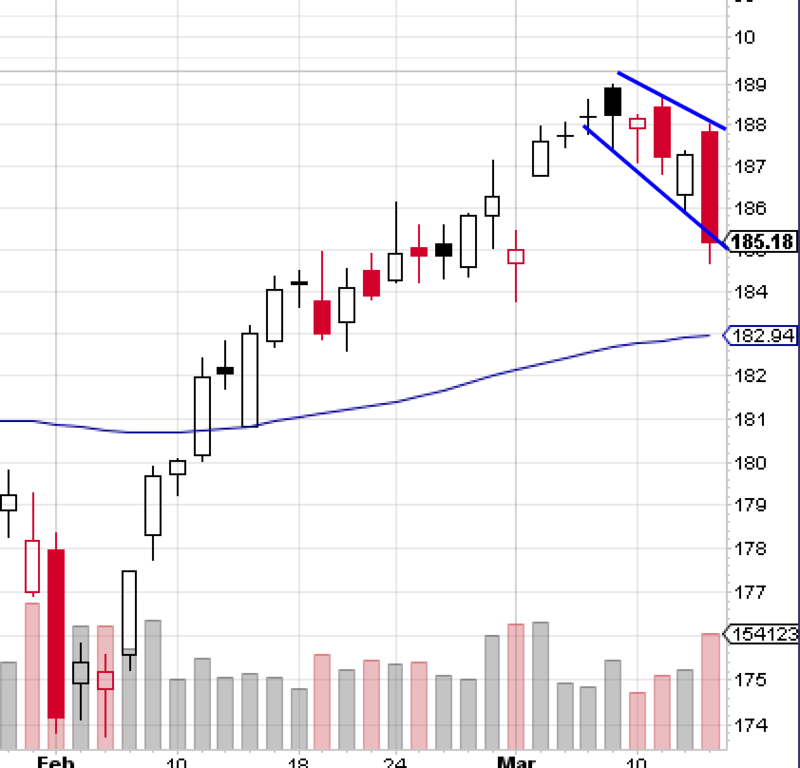 $SPY: Is this a potential bull flag? 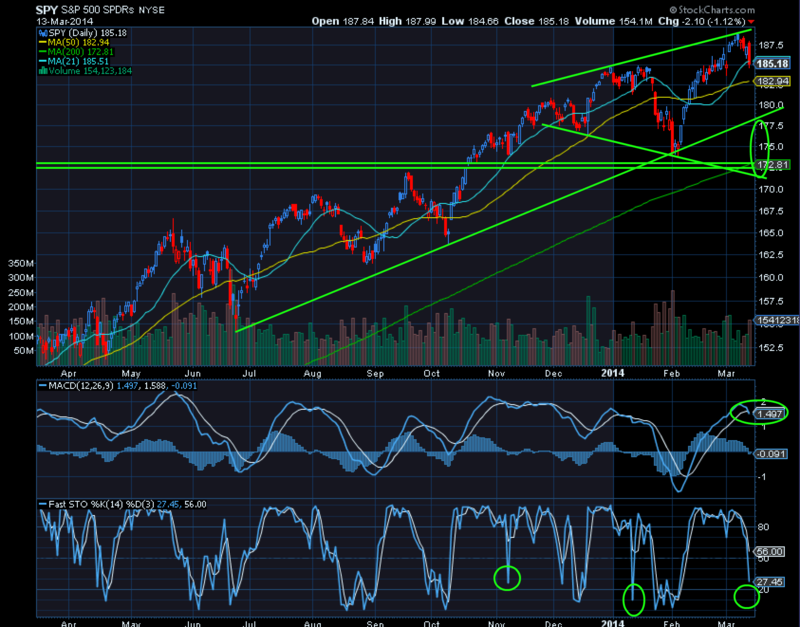 Don’t know, but a move today back into the channel and a close above the 21MA would certainly open that possibility.